Dude Love's classic tie-dye shirt has been one of the more popular Attitude Era shirts on the second-hand market for a long time, and actually doesn't surface as much as you might think it would. As evidenced by eBay user briumph's auction, for which bidding has already reached $52 as of this writing with 5 days remaining and not even listing Dude Love's name in the title, it's not likely this one is going to come cheap again any time soon. Being the least utilized of Mick Foley's famous 3 faces—only appearing for a brief period over 1997-1998, aside from an appearance on Raw 1000—there probably isn't a whole lot of these left around these days, given it was only available for a short window of time. Etsy seller SnyderOnPark has come through this week with one of the coolest shirts from the early 90s. Released in 1991, shortly after his Survivor Series 1990 debut, this is the first shirt ever produced for The Undertaker. While not shown in detail in the listing's photos, this shirt was produced with the WWF branded tag, which is still in tact. 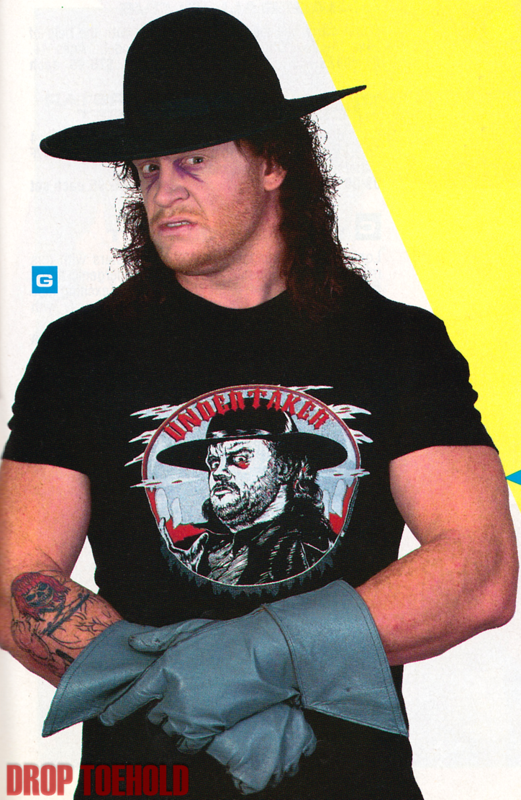 The now-defunct Drop Toehold has gifted the world with a scan from a merch catalog from the era showing Undertaker modeling this design, which can be viewed here. The folks at The Savage Stash, which has quickly become one of our favorite vintage wrestling merch providers, have taken the world's Daryl Takahashi obsession a level higher with their memorial pin collaboration with LapelYeah. The desire for any and all things Daryl is proven with the nearly instant sell-out of this item, but perhaps with the level of demand, we can get a commemorative resurrection reissue if we beg enough? Unfortunately, these pins are all gone, so get to begging in The Savage Stash's Instagram comments for somebody to part with theirs. These vintage WWF cookie cutters from eBay user theangryspider should be enough motivation alone to make you start planning your WrestleMania parties now. It makes cookies shaped like Macho Man, Hulk, Big Boss Man, and the classic WWF logo. What more needs to be said? The price here is high at $50 for the set, but the same set has recently ended for less than $20, and this seller has 4 sets available, so use that Make Offer option and see what you can make happen. Every once in a while, WWE Shop drops us a sleeper hit like this. This fantastic over-the-top gym-inspired design (which, admittedly, is printed on an unfortunate purple color) only helps to cement the Titus Brand's cult status. Much like the Dude Love shirt above, don't anticipate that this will be around very long, but given the humorous and lovable nature of the current Titus character and his brand, now etched permanently in the annals of time with Tozawa's recent Cruiserweight Championship win, this could very possibly turn into a future rare and sought-after shirt in the future. It may be a bit steep at $24.99, but more often than not there is a great shirt sale on the WWE Shop site, or grab it on the clearance page in 6 months.